I’ve been at this for 23 Fall startups now and I’ve yet to find the “perfect” room configuration. Over time, I’ve managed to get the task of setting up – at least for Day 1 – down to a two-day affair, but it is not without angst. The desks for the students are arranged in the front 2/3 of the classroom space. This year I have an ELMO and projection equipment to include for whole-group lessons or for sharing examples of student work. The classroom already has a pull down screen at the front of the room over the white board. Off to the side there are some shelves and cabinets for storage and a sink (big smile). At the rear of the room, opposite the white board, I have placed 5 2-shelf units that comprise the Leveled Library for the classroom. There is a tack board above these shelves. In this area, I have a large gathering rug, a sizable rolling easel, and a rectangular table (doubling as extra small group instructional space and a listening center area). The alphabet chart is above this board. I generally have the students help decide where the wall displays are going, but in the case of the alphabet chart – a royal pain to hang on a good day – the decision is fait accompli. 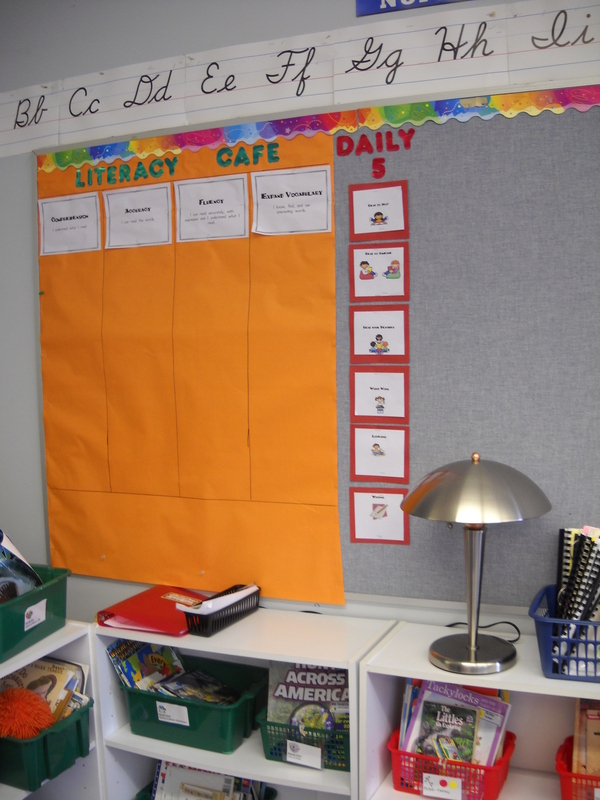 This year I am implementing the Literacy Cafe along with the Daily Five as a management tool. The Cafe strategy board is to the left of the image. I’m still struggling with where to put a Choice chart for students. 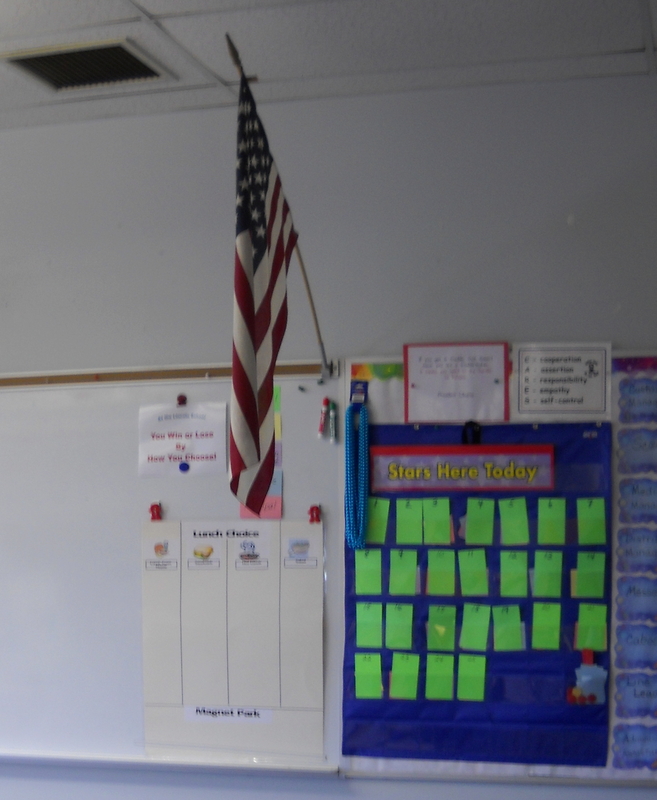 Another important area in the classroom is our Behavior Tracking area near the exit door. This is a spot for students to monitor their behavior color and it is also where the daily schedule will be posted. To the left of the behavior chart is a lunch choice board. Students are expected to make one of 4 lunch choices as they enter the classroom by placing a personal magnet under the choice for the day. This choice board doubles as an attendance check-in for me. If the meal magnet hasn’t moved from the ‘parking lot’, then the student is absent – otherwise I get to choose lunch for them. Since I teach Third Grade, this routine is pretty reliably run by the students. I use magazine boxes to store students’ reading materials. 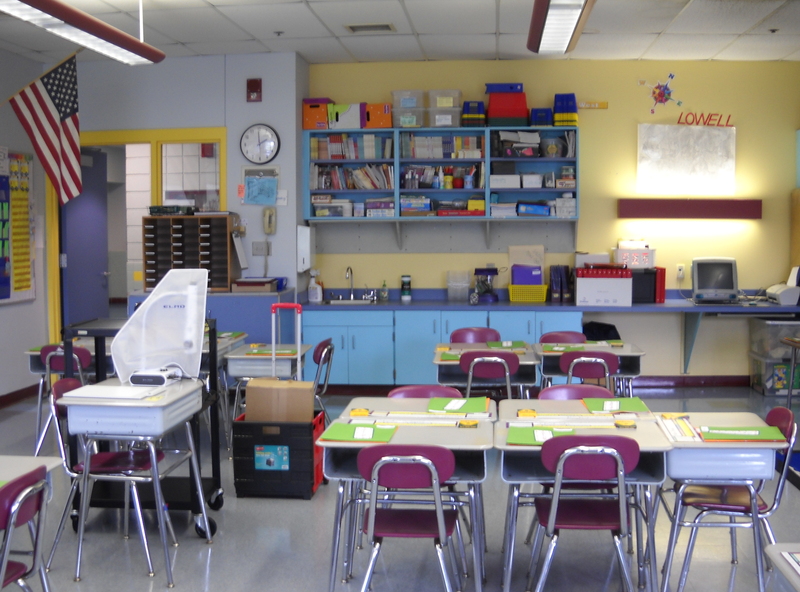 Those boxes are stored on the counter top between the classroom’s windows. When it is time to begin reading activities, student retrieve the magazine box and keep it on the floor next to their desk or wherever else they may be working during Reading Workshop. Now for the test: students arrive Tuesday and we will see how successful this room configuration is.